I have a new doorstop. I get a new one every year. It's heavy and hard to carry around. It will end up sitting in my car for a over a month as I thoroughly flip through it and rip to pieces filing everything into various folders that I use for inspiration. The name "doorstop" has been given to it by my husband in 2007, when I dragged it home and dropped it on the dining table with a very dull thud. 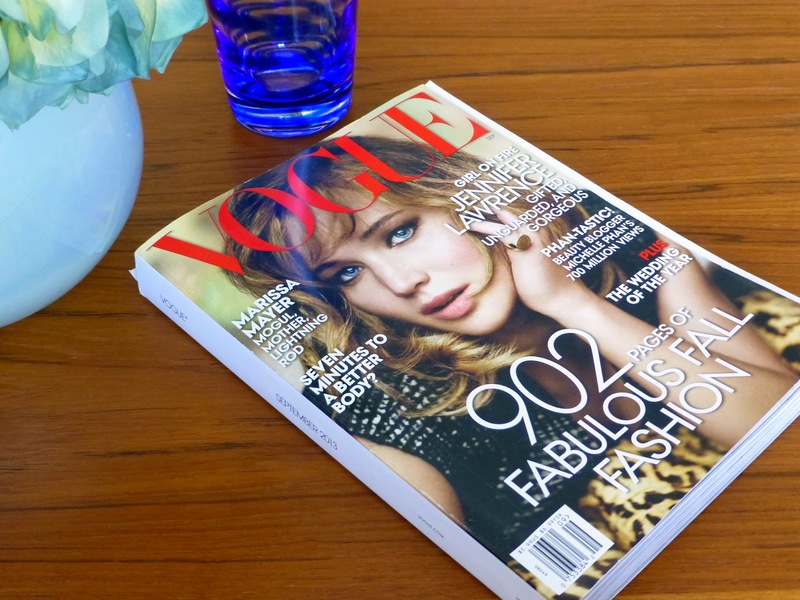 Everyone else calls it Vogue, The September Issue. I'm trying to figure out the best position to read it, no matter which way I tried so far I ended up with some body part either numb or in pain. I think the best way to do it is to use my steering wheel as a magazine holder, again. But we all know that, in the end, it'll end up in the reading materials basket in the throne room. Wake in the late morning (after sleeping in, of course, since it is a rare work-free Sunday) and decide that you’re going to brave IKEA today because you just have to have that new chandelier. Share your idea with your Urban Idiot partner. By some miracle, he doesn’t freak out nor suggest that you’re on crack. Decide that a stop at Lowes for new blinds and some shoe shopping should also be accomplished in one drive. Plan your attack. Urban Idiot Kid suggests a lunch at McDonalds. Add that do the list. Do fish water maintenance which takes now a whole hour, measure windows (top and bottom because they’re not at a 90º angle and you, thank God, learned a previous lesson), make IKEA list, forget the list, get into the car. Realize that the only thing you ate so far was a Greek yogurt and that you forgot your cup of tea as usual. Rest of your Urban Idiots are well fed, the little one even has the foresight of bringing a bag of goldfish for the car ride. Which he consumes on the way to Lowes and spreads powered cheddar cheese all over the back seat. Vow to never allow flavor-blasted cheddar goldfish in car again (yeah, right!). Split up at Lowes with one going to get blinds, two going to investigate tile. Fall in love with everything glass, Italian, and expensive; lay out tile patterns on the floor and discuss. UIKid lays out a classic brick subway tile pattern, you attempt to talk him into a modern horizontal stack. Mentally figure out tile cost in your head, but keep that to yourself. Pick up some lawn waste bags because in your mind you’re a super woman that will be trimming the seven foot tall rose bushes tonight as well. Attempt to load the car. The blind boxes are too long so you lower the seats and prop them up with a sofa parasite (aka a square pillow) that now permanently lives in your car just for that purpose. Drive toward home very slowly, or at least at the speed limit. Do some very successful shoe shopping on the way. You’re now starving. Finally head over to IKEA. You choose Bolingbrook because A: it’s closer, and B: it’s smaller so there should be less screaming children. Run into construction on the way, of course. Find the parking lot only 2/3 full, park in the family parking area because your kid is with you. You need Lighting, but you start at the top and walk the entire two floors because you have no clue where Lighting is. Pick up a couple of small items on the way. At some point realize that your neck is all stiff again and no longer working, so instead of cornering like a Mercedes around people you now corner like a Mac truck by taking extremely wide turns. Finally locate Lighting (which is on the bottom floor, closer to the entrance) only to discover that your chandelier is nowhere to be found. Find a sales person hiding in a corner and ask for help. You’re told that your light sold out in one day and they’re not getting any more any time soon, but Schaumburg has 15. Tell the other Urban Idiot that the light is sold out. Both start having a déjà vu, because last time you needed something at IKEA, you ended up going to both in one day to get what you wanted. You look at each other, then you ask what time it is. On the way out of the parking lot, about 500 feet from the IKEA front door, you encounter Urban Idiots in Training, who are attempting to shove a large chair back into the small trunk opening of an old sedan. There are four of them, all male, attempting the task. They're blocking a turning lane. You mentally wish them good luck, as your UIHusband lays course toward IKEA #2. In exactly one hour you drive to Schaumburg IKEA, find the chandelier (this time asking where the Lighting section is first), get the couple of items you picked out in Bolingbrook but didn’t get because standing in a check-out line would have wasted your traveling time, buy the meatballs, check out and leave. You now have a migraine. Your UIHusband pours himself a nice smooth golden beverage in a crystal glass when you finally come home. Your UIKid tells you: “Thank God we’re home, now I can relax!” You check out gas prices because all this driving ate more than a quarter tank and you will need gas to take your kid to school this week. At some point, before Slurpie takes his usual dinner spot on the chimney, the blinds will go up. The chandelier is left in the box on the dining room table. It’s in a million pieces and you’re leaving that task to the Ukrainian contractors who, at some point, will have the unfortunate task of hanging it up 20 feet in the air. Truffles. Homemade chocolate truffles. It was 2005, we were about to host over 40 people at our house for our Absolut Thirty birthdays bash and my chocolate truffles were on the top of a very long menu. I find truffle making relaxing and theraputic, and I always look forward making them. On a Saturday morning, we headed out to find the ingredients. The recipe called for semi-sweet, bittersweet chocolate, and crème fraîche. I found the chocolate at Williams Sonoma. All we had to do was pop into a grocery store on the way home and get the crème fraîche. I figured that in less than half an hour I would be elbow deep in chocolate, completely relaxed. I was wrong. We stood in front of Jewel’s dairy isle in disbelief – there was no crème fraîche. Could they be all out? Maybe it was in a different section, only I couldn’t fathom where it could possibly be other than next to sour creams. I finally found a stock boy and asked for help. But he looked at me as if I was an alien and directed me to customer service. “I was wondering if you could help me find crème fraîche, please?” I said in the nicest possible way to a short rotund woman with large teased 80's hairstyle behind the customer service desk. “What, honey? What are you looking for?” the woman replied. “Crème fraîche,” I repeated slowly. “I don’t know what that is, honey,” the woman said. I almost choked. “It’s a dairy. It’s kind of like a sour cream,” I said in disbelief. “Oh… Let me call the dairy manager then.” She paged the dairy manager and had a small hushed discussion over the phone before turning back to me. I was slowly starting to steam: no one calls me ‘honey’. “He said that we don’t carry that. He doesn’t even know what that is. It must be a specialty item, you might want to try a gourmet foods store.” I could not believe this, as far as I could remember I could get crème fraîche anywhere when we lived on the North Shore. But then we moved to the Western Suburbs. “Thanks,” said I through clenched teeth and left the store. Our half an hour was wasted and I was nowhere close to my truffles. We got into our car and the only gourmet foods store Terry could think of in the vicinity was Whole Foods in Wheaton, 30 minutes away. There they were: little containers with hot pink lids. 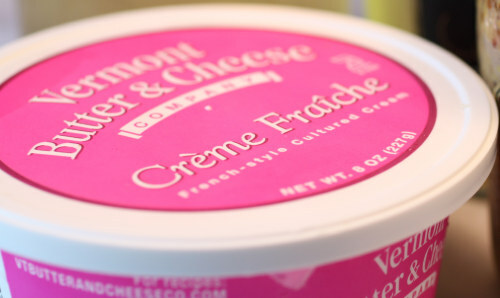 Crème fraîche. It was next to sour creams, as it was supposed to be, and I bought more than I needed. Whole Foods was nowhere near our house, I wasn’t planning on returning. With my bounty safe and secure in our basket, we proceeded to check out all the isles and grab everything else that might be considered “gourmet” in this part of the world. ‘We moved to the freaking boonies…’ I thought as I raided the isles, ‘how could you be a dairy manager and not know what crème fraîche is?’ I still had a look of disgust on my face when we finally pulled into our garage. A couple of years later, Trader Joes opened a block away from me. In their dairy isle, next to sour cream, stood a little tower crème fraîche containers. Finally, I could call Batavia home. Recently, Terry was out picking up a couple of items from Jewel. I was cooking and realized I needed champagne vinegar. I texted him, figuring that, by now, Jewel would have something like this. After a long while, Terry texted me back: "It must be in the same isle as crème fraîche". With school supplies finally sorted and labeled, my attention turned a more pressing matter – fall fashion. Armed with Pantone® fall color guide and a list of trends compiled after browsing too many fashion and retail sites in the middle of the night (thank you very much insomnia), I’m preparing my assault on my closet come Labor Day. Boy am I glad I kept those leopard shoes! 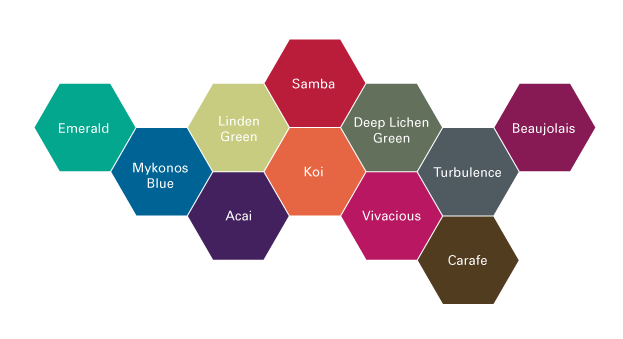 PANTONE® Fall 2013 Color Guide. Houndstooth – the classic is back. Big or small, the pattern works for everyone and goes with everything. Catchy outwear – time to update that coat! This is an opportunity to step out of the box and buy something other than black. Hats – the it hat of the season is a knit beanie. However, it’s not for every head shape or age group, so find a hat that works for you and rock it. I would stay away from a cowboy hat though. Leopard! It’s baaaack! A little leopard can go a long way. You can also kill two birds with one stone by splurging on a leopard coat: leopard and catchy outwear trends in one. The reason a leopard coat is a splurge and not an investment is because you will not want to wear it for more than one season, unless you live in New Jersey (but then you would already have a leopard coat). Emerald green – The Pantone® color of 2013. It pairs well with other jewel tones, or an emerald shoe or a structured bag can be the perfect “cherry on top” to finish off your outfit. If you’re lucky to own real emeralds, wear them every day. Even to the grocery store. Winter white – Labor Day is no longer then end of the white season. But put the summer light fabrics away and instead do white in a chunky knit, or skinny jeans or a textured structured jacket. Peplum – first appearing this spring, is still trending hot. So don’t put it away. If you don’t have one yet, peplum is very flattering: it makes waists appear smaller, or adds a bit a hip if you really really need some. Military-inspired – khaki green (or Deep Lichen Green®) is sticking around. Do it in a soft girly way: a slim pant or mix it up with some lace or a fur for a luxe look. Or, if you’re brave enough: military green with a leopard print in a skinny jean (I actually saw a pair a couple of nights ago. Blocked the store name out of my mind on purpose). Leather – not head to toe, unless you’re riding a Harley, but do mix it into your regular wardrobe. Colored leather’s works too. Turtleneck – shown layered under jackets and coats. Now this is a trend I’ll be skipping because I am not about to die from heat, even if it will get cold. Over-the-knee boots – if you have them from a couple of years ago, dust them off. Or try a leather legging with an ankle bootie for a similar look. Camel topcoat – enjoy a bit of color before the going back to black winter coats. An investment piece if you don’t already own one, camel is a classic. Plaid suiting – this season’s plaid is bigger and bolder than the previous seasons. Pair with a solid shirt and a tie. Slim pants – pants (and suits) are getting slimmer and slimmer. If you didn’t have a reason to work out before, you do now. Pair a slim pant with a chunky sole shoe to visually even things out. A gray wool slim trouser works great for the office. Tweed suit – a fall staple, updated in a slim tailored way. Motorcycle jacket – the classic is back. Just don’t do the whole white t-shirt and ripped jeans thing, that’s out. Turtleneck – a quick and easy update to your suit. If James Bond can do it, so can you.